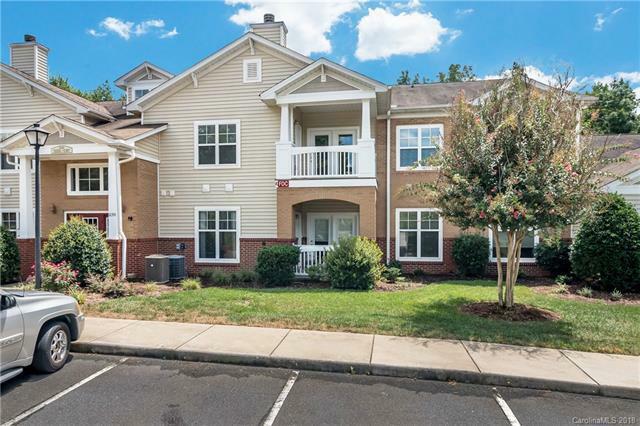 All on one level, end unit condo with an attached 1 car garage in prime Ballantyne location. Open plan with vaulted ceilings and split bedrooms. Freshly painted interior. 2 bedrooms plus a study with built-in bookcases and French doors. Large master bedroom with vaulted ceiling, spacious walk-in closet and full bath with big tub, separate shower, linen closet and raised sinks. Kitchen features abundant cabinet space plus a Fisher-Paykel double drawer dishwasher. Laundry room also has cabinets. Ceiling fans in the great room, both bedrooms and study. Storage closet off the balcony. Condo is located at the end of the building and end of the street. Attached side entry one car garage with door to hallway that leads to the stairs. Community pool and tennis. Close to shopping, restaurants, movies and more.